You may know ABC Home and Carpet: located near Union Square, buying a pillow in this expensive home furnishing store may cost you an arm and a leg. Well, it is on their ground floor that ABC Cocina is located. 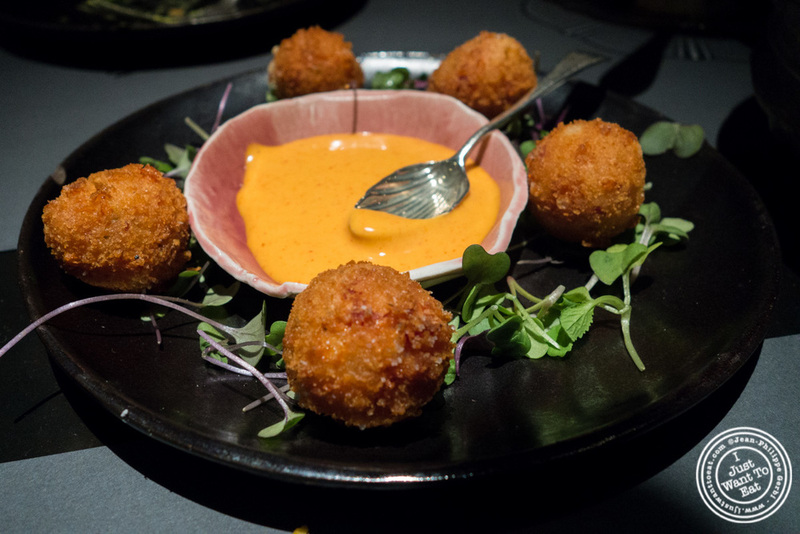 This innovative Latin restaurant is another step in the success story of Jean-Georges Vongerichten, the French Chef who gave us Vong, Spice Market or Jean-Georges. This restaurant is impressive: high ceiling with lights that seem to be there as an extension of the store, very trendy. We went for brunch and it was crowded. So I strongly suggest having a reservation. Don't be fooled by the menu items: seasonal, they are definitely familiar, but the Chef adds its own twist to make it his own. The principle is similar to restaurants like Spice Market: it is family style, with a choice of small and large dishes to share, that will come as they are ready. They suggested three dishes per person, not including dessert. We decided to go for four dishes and the dessert, thinking that we could order more if need be. Strangely, after we ordered, the waiter asked us if we wanted bread. We said yes, surprised by the question, and wondering if they would charge us for it. In the bread basket, was some delicious focaccia that I enjoyed dipped in olive oil, that was a better alternative to the little bottle with an orange liquid in it that was on each table. It was served with a large tortilla and some tortilla chips that were homemade. The presentation was beautiful, with all these different greens. It was a delicious guacamole, freshly made, and I loved that the added crunch that the peas were adding. There were five of them, small, so I was a bit surprised when the dish came. Fortunately, they were good: crispy outside, delightfully greasy and gooey as advertise. This was fantastic: not only presentation wise, but taste wise, the two main components pairing perfectly together, the star being the mushroom that had this nice charred taste. 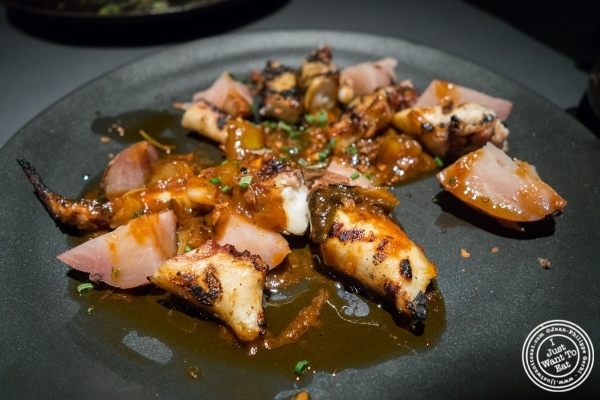 I love octopus and my craving was definitely satisfied: tender, it also had a nice char taste. I did not really care at that point about the potatoes. The last dish was our dessert: the churros with an apricot cajeta (Mexican thickened syrup). Normally, it is a pineapple cajeta, but I guess they were out of it. 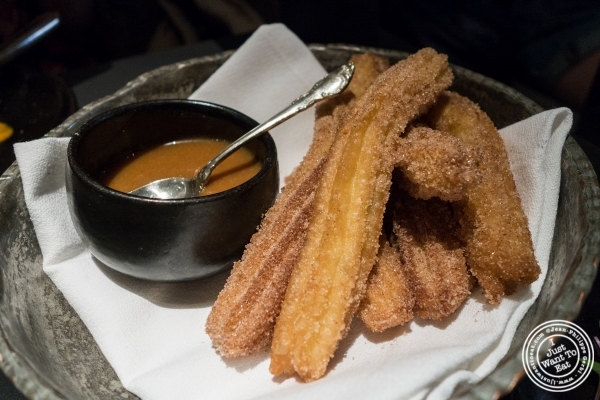 No big deal: these churros were divine. My drink of choice for this brunch? Espresso! The brunch at ABC Cocina was fantastic. 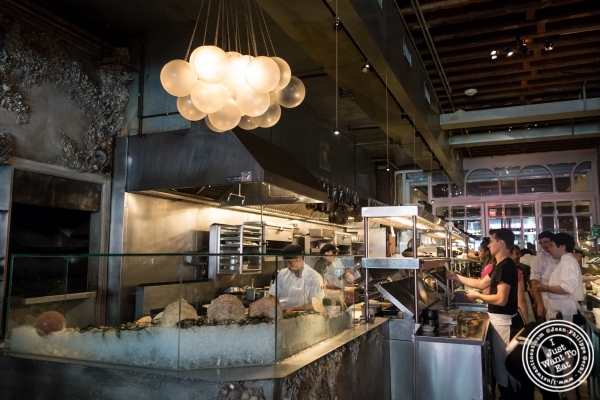 Yes it is on the pricey side, but it is definitely worth it and I can't wait to go back and try some other mouth watering dishes.